Suitable for anyone and any wheelchair – see our range of users here. Easy to set-up and use – ready to go out of the box – see here. Record speed, distance & calories – connects to your phone or tablet! 5* reviews – read comments from our happy users here. We deliver Worldwide – direct to your home, clinic, gym – anywhere. We will always charge the lowest possible price, so please email to check latest. New! – over 100 virtual tours available. Explore the World whilst exercising. How will the trainer work for me? It’s suitable for everyone and any goal. Unbelievable cardio workout boosting your fitness. Burn up to 350 kcal every 30 minutes and record the calories lost. Build shoulder strength and muscles. Improve your technique and become more efficient. Push better on the road, track or court. Endless workouts to vary and keep you engaged – plus Wheel-Spin DVD. Can you alter the resistance? Yes – you can easily alter each side of the trainer and the angle of the rollers to increase or decrease the spin of your wheels and training resistance. We have a video explaining how to do this – click here. Who is the trainer for? The trainer is suitable for any wheelchair user who wants to improve their overall fitness – whether your goal is to lose weight, increase strength or improve balance the trainer can help – and it’s also suitable for any manual wheelchair. We have people who competed at Rio 2016 using our trainer to get quicker and faster on the court or track – and also people using them at home in their shed burning calories and losing weight. Whatever your disability if you can use a manual wheelchair the trainer is for you – to see our photo gallery click here. Yes – you will burn approx 300 – 350 kcal in a 30 minute workout. This is more than you would burn on a bike! The reason being is you burn more calories using your arms and upper body. If weight loss is your goal then the trainer is for you. Check out our calorie testing at Shrewsbury University – click here. Will it improve my sport? Yes – it simulates pushing a chair just like you would on the road, so you can use the trainer to build up strength and improve your technique which will then transfer to the court or track. If you play a wheelchair sport and want to get faster then the trainer is for you. What is the size of the trainer? When the trainer is fully assembled it is 105 cm X 120 cm – but you can easily remove the ramps and fold the rollers for storage when not in use. Each ramp is 80 cm X 41 cm and when folded the trainer is 30 cm X 50 cm X 50 cm. Where can I try the trainer? You can arrange to visit us to try the trainer or we have some selected places that have demo trainers available. This is growing all the time so contact us to see where the closest to you is. Try at home! – we offer a no quibble 14 day return, so buy a trainer and we’ll post it direct to you – it’s easy to set-up and you can try it for 14 days. If it’s not for you then return it to us for a full no quibble refund. Standard – complete trainer but no data recording. Smart – able to record speed and distance connected to a phone or tablet. Smart Plus – records everything, heart rate and calories plus a phone stand. What about if I'm new to wheelchairs? If you have not used a wheelchair for long then the trainer is ideal – we have a number of spinal cord injury units using them to teach people how to push and build up strength. You can practise and use the trainer so it improves your pushing everyday out and about. Is the trainer easy to assemble? You can assemble the trainer within 10 minutes and it is easy to do – we have video tutorials showing you how as well as written instructions. View instructions and videos here. Try our trainer for 7 days in the comfort of your own home. We understand there is nothing better than ‘having-a-go’ and trying out a product before you commit to buying one – which is why we are excited to now be able to offer our FREE* home trial – we have taken the ‘home demo’ to new level! Yes, we will deliver a complete smart plus Invictus Active Trainer direct to your door and leave it with you for 7 days to test and try. If you are looking to improve your fitness then we are confident that the trainer will work for you – so much so we are happy for you to try it without any commitment or pressure to go ahead and purchase. Complete our quick form below to provide your details. We take a single £1 payment as verification. We deliver a trainer, ready to use out of the box, within 7 days. All instructions, help and advice is provided. You set-up and use it in your home! We contact you to see if you would like to keep it. If you do we take payment, if not we arrange collection. No commitment, pressure or obligation. * We take a £1 verification payment, which is used to verify the details provided are correct for delivery. Available UK mainland only. Our trainer is used within hospitals across the UK. We were on TV – twice! Inclusive fitness at it’s best! Our smart model is Bluetooth enabled and records all the data you need for a complete training programme – including speed, distance, heart rate and calories burnt. You can save your workouts and see your progress over time within the app on your phone or tablet. We offer a FREE home trial, where we send you a complete trainer to try at home for 7 days. If you like it then pay and keep it! – no obligation and no pressure. Sandra - love the DVD! I’m finding the trainer great . I’m not a triathlete or anything but I had noticed that over time my wheeling had got more right-handed. I ended up with a left shoulder blade sprain last year. Since then I’ve been trying to wheel a bit more evenly which is quite difficult with bumps and cambers on roads. I’ve set up the trainer in front of a mirror so I can see when I’m leaning over to my dominant side. I think things are getting a bit better and the left side is definitely starting to strengthen up! That trainer is SUPER!! I give it a place in my living-room , so I can look TV when i’m using wheelchair)trainer.I use it daily. When I’m looking at TV,I train. Thought, every day 1/2 hour is good. But I love to being busy , and sometimes I can stay 1.5 hours or longer on it (and being busy). Thanks for that!!!! – Dirk, Belgium. I’m enjoying my new Invictus Trainer. Slowly rebuilding strength, I love feeling active and invigorated again. The trainer is great. Very easy to set up and use and I am not very mechanically minded. The smart tools are excellent and really help you keep track of how well you are progressing. Combine this with the excellent dvd Wheel Spin and it will get you fit in next to no time! Only slight downside was it was a bit heavier than I was anticipating. So this may mean people with weakness in the arms or hands may find it a bit tougher to set up without help. All in all an excellent bit of kit that I would highly recommend. Would also commend the customer service I was provided too to keep me up to date about when it was being sent to me. Thank you! Trainer is all set-up in it’s own spot – all working great please find photo requested. Thanks again, Keith. Using my trainer to train for the London marathon and a ‘5 marathons 5 days’ challenge in 2017! Combined with pushing on the road it is helping me with my fitness, thanks guys great bit of kit. Glen. As a personal trainer I have several clients that I work with, I visited their home and provide one-to-one physio and fitness training. The trainer is a great addition to the cardio side and I am seeing some good results, Regards Rowan. Hi everyone I have got my set and wow there brill i can’t beleve just how hard they make you work and so easy to use it has also helped me sort out where i was going wrong with my pushing skills to more presure on my right then left so i am working on that brill peace of kit to have and a brill company too how care about there customers thank you guys and good luck . ps i will put a pic up later. Please find my picture. I hope this will do. Scott and Paul were very helpful and patient I love my trainer I could exercise indoors because where I come from witch is the great state is Pennsylvania we get a lot of snow in the winter! We Get Many Great Comments and Tweets! School embraces Trainer with great pupil feedback! RJAH Midlands Spinal Hospital - trainer set-up! Case Study: Sam Eardley using our Invictus Active Trainer to train for the Oxford marathon. Tennis Foundation and our sport training rollers! Greece Paralympic Committee - rollers shipped for training. David Weir warming up before Great North Run - on our rollers! The BEST puncture proof wheelchair tyres - reduced! Case Study: Make gyms more accessible and inclusive. Wheelchair front wheel thingamajig! - what is it? Read more of our latest news! – see what we have been up too – click here. The trainer was designed and developed in 2015 by Paul Cooksey and Scott Smith – made and manufactured in the UK we have and are able to deliver the trainer anywhere in the World. In 2007 Paul left hospital after recovering from a spinal cord injury which included 51 weeks bedrest due to a pressure sore – he could hardly push his manual wheelchair independently and started his journey to becoming an active wheelchair user. The Superhumans Show is a popular weekly TV show hosted by Alex Brooker – they had a special guest who they wanted to put through their paces and needed the ultimate machine – so we got invited to bring along our trainer! Watch our video below – also click here for more photos and videos. This unique high-energy seated and wheelchair aerobics workout presented by renowned disability fitness instructor Kris Saunders-Stowe provides energetic workout (beginner and progressive) workouts using the Invictus Active Trainer. We first launched our trainer at Naidex – the UK’s largest disability and health show held at the NEC in Birmingham. 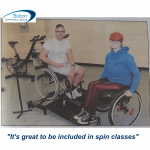 The Invictus Active Trainer provides the solution for gyms and leisure facilities to be inclusive – not only as a specialised piece of fitness equipment within a gym but to enable a wheelchair user to take part in a bike spin class. We help you take ‘inclusive fitness’ to a new level and work with gyms across the globe. To find out more click here. Please are happy to be supporting and sponsoring these people – if you are taking part in a similar challenge then please do get in touch.